1: Bennieboj has 8 highscores. 2: MAD_JO3 has 5 highscores. 3: alpmaster has 3 highscores. 3: snowstorm has 3 highscores. 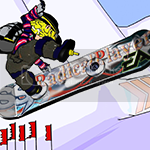 5: RadicalPlayer has 2 highscores.